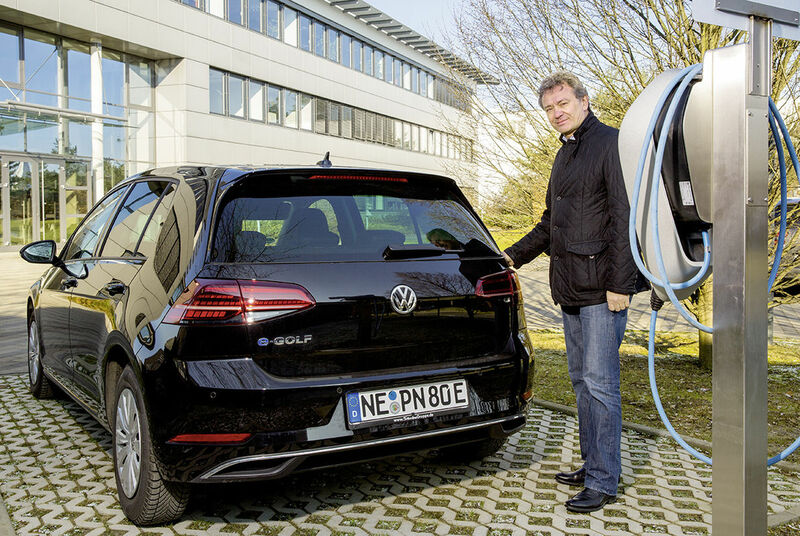 Tobias Kasperlik looks skeptical as he settles into the driver’s seat of the E-Golf. True, there’s nothing in the vehicle interior that’s unfamiliar to the head of Rheinmetall Automotive’s Aftermarket division, but when he pushes the start button – apart from the dashboard displays lighting up – nothing seems to happen. But then suddenly, the vehicle starts to move, silently accelerating. This is the first time Kasperlik has ever driven a vehicle powered solely be electricity. He’s keen to experience the vehicle, wondering out loud whether the market is ready for e-vehicles, especially given the still patchy infrastructure. But after just a few meters, he’s clearly impressed: “The acceleration is amazing.” It remained to be seen how the vehicle would react to the Northern-Germany-born executive’s dynamic driving style on a freezing cold day in Düsseldorf. He knows his way around Düsseldorf, having completed his legal internship in the city. Even then, it was clear to him that he didn’t want to practice law. What’s more, ever since he was a young teenager, he’d had a passion for “everything on two or four wheels that was fast.” His first car, a not-exactly-speedy Opel “Kadett A” already earmarked for the scrapyard, was given to him by an Opel dealer. He was just 14 at the time. Learning the hard way, he and a friend completely rebuilt the transmission, among other things, and eventually managed to get the vehicle up and running again. The question as to whether the proud young mechanic ever drove the car himself remains shrouded in secrecy. His passion for the automobile never waned. While he was studying law in Münster, he was able to top up his income by selling classic cars. Kasperlik was primarily interested in rust-free automobiles, which he would search for in the arid American West. This combination of hobby and travel turned out to be a big plus for his continued legal training, for he was one of very few young lawyers selected to spend part of their internships in the United States. His international training also came in handy after Kasperlik passed his second state legal exam. When looking for his first job, his love of cars naturally drew him to the automobile industry: he found his niche at Mannesmann VDO, where the purchasing department was looking for a lawyer with international experience. He was supposed to provide his purchasing colleagues with legal support: “I was very surprised by how few things were contractually documented back then, even in major transactions between customers and suppliers that involved major capital expenditure. On the other hand, disputes were rare.” Today, according to Kasperlik, companies are a lot more likely to go to court, due in part to the enormous size of the sums in dispute, for example when large numbers of defective products have to be recalled. In the meantime, Kasperlik – as if acting on instinct – repeatedly eyes the Golf’s range indicator. He’s been driving now for 15 minutes, and the batteries are still good for another 228 kilometers. After embarking on his career, he found himself involved in the operational side of the business far more quickly than he expected. Kasperlik, a 57-year-old family man with two daughters, says his career has been a perfect combination of technical, commercial, and legal work – even though he has to admit that he’s had less to do with actual cars than he originally expected. From the outside, it almost looks like any other Golf. Under the hood, though, everything's definitely different. But his lifelong hobby of collecting and restoring old cars still stands him in good stead, with the accent on sleek design and powerful engines. His current favorites are a 1962 Jaguar E-Type coupé and a very rare Intermecchanica Italia from 1969, of which only around 300 were produced. In the meantime, Kasperlik has driven through Düsseldorf’s famous Old Town, already warming-up for this year's carnival. After stopping in the city’s Medienhafen district, he heads back to the other side of the Rhine. Precise and to the point, he sums up his impressions in true Northern German fashion: “Better than expected,” declares this fan of classic Porsches. “The Golf is unusually quiet and handles just like other members of its family. And the acceleration is impressive.” It all comes down now to getting the operating perimeters right, things like charging times. And speaking of charging: after 27 kilometers of driving at moderate speeds in urban traffic and in wintery conditions (without anyone feeling cold in the passenger compartment! ), the E-Golf – which incidentally has a very roomy trunk – still had a range of 171 kilometers. After such a short trip, recharging wasn't really necessary: at the end of the test drive, the E-Golf still had a range of 171 kilometers.